Congratulations Krista!! Now all you have to do is reply to the email I will be sending you in just a few minutes within 48 hours with your full name and mailing address and I will get these 2 great books out to you!! They say April Showers Bring May Flowers! 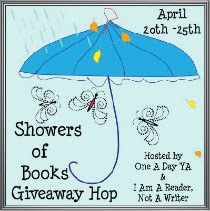 This April will find you showered in books during the "Showers of Books" Giveaway Hop! Hosted by I Am A Reader, Not A Writer & One A Day Y.A. The first is A Bastion Club novel (all those yummy single men trying to pick their own wives and stay away from the Momma's of eligible young ladies during the "season". Deverell, Viscount Paignton, is in desperate need of a wife. Unmoved by the matchmaking "herd," he seeks help from his aunt, who directs him to a lady she vows is perfect for him. Dispatched to a country house party to look the lady over, he discovers her not swanning about among the guests but with her nose buried in a book in the library. Phoebe Malleson is tempted to distraction by Deverell, but marrying him isn't part of her plan. Moved by an incident in her past, Phoebe has a secret cause to which she's committed. Unfortunately, telling Deverell to go away doesn't work, and he quickly learns of her secret. But someone powerful has her cause targeted for destruction--and her in their sights. Phoebe must accept Deverell's help...though the cost to them both might be dear--and deadly. The second is a Cynster novel--but this in the Cynster Sister Trilogy!! Of course those Cynster men get involved and actually need the help of the Bastion club guys as well at one point!! But have no fear--the Cynster women can take care of themselves!! Brazenly kidnapped from her sister Heather's engagement ball, Eliza Cynster is spirited north to Edinburgh. Desperate and determined to escape, she seizes upon the first possible champion who happens along--gentleman scholar Jeremy Carling. Villains and rescues are a far cry from Jeremy's expertise, yet he cannot abandon a damsel in distress. But danger lurks and hurdles abound in their race to escape the mysterious laird, until a final confrontation on a windswept cliff reveals what their future life could hold--if both are bold enough to capture and own the unexpected love they now share. Please remember to put your email in each comment so that at the end of this giveaway and I come back from Random.org with the winning number--I will be able to contact you!! Mandatory: Do you like Stephanie Laurens Cynster and Bastion Club books? A simple yes or no will do!! And now on to the linky listing of all the other participants in this wonderful giveaway hop!! Do you like Stephanie Laurens Cynster and Bastion Club books? Haven't read either series, so I would not mind either. I love Stephanie Laurens. She's one of my top 5 favorite Authors. Love Devil Cynstar. :)Thank you for this awesome giveaway. Linky under Lucky4750 (at)aol (dot) com. I have Signed up for your email. I don't think I've read them yet. I haven't read them yet - but I bet I would like them! I have never read any! Yes I do love their books. Thanks for the giveaway! They are new authors to me. Haven't read yet, but they look good. I love the author. Love the Cynsters & the Bastion Club! I haven't read any of these books yet?!?!? I love her books. Thank you for the giveaway. I LOVE Stephanie Laurens. I have almost all her books! My answer is actually yes and no. Yes, because some of them like A Secret Love are amazing, but at the same time, they are a bit repetitive and it seems never ending.